A few weeks ago I was flipping through an L.L.Bean catalog and saw these two quilts. I loved both and filed them away for inspiration for future projects. (Like post-move at this point.) 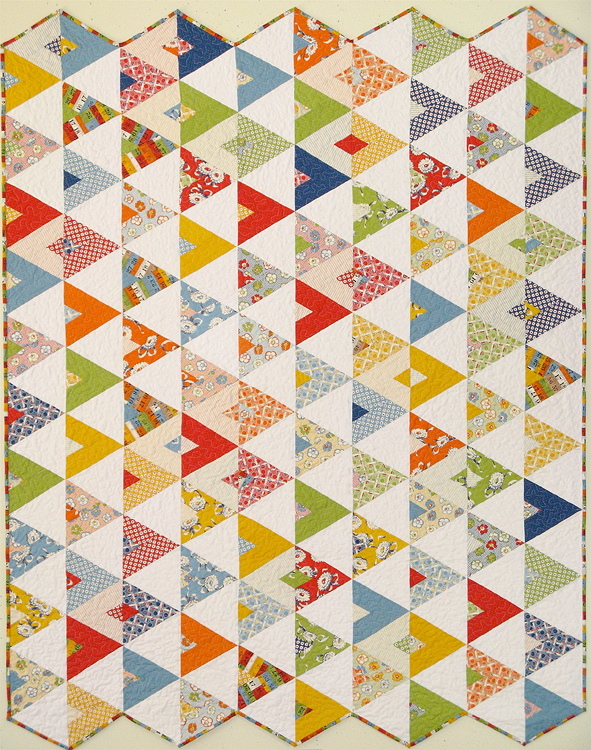 I especially love that triangles quilt – it would be perfect way to bust through some of my American Jane fabric stash. It particularly reminds me of this quilt, and looks a tad easier. So guess what my wondering eyes beheld when my mother-in-law showed me the newly decorated bedroom for her 2 youngest boys. Great minds do think alike. And have really good taste. These are those two boys, my husband’s younger brothers. They are pretty much the perfect uncles because not only do they like to play Wii with the nieces and nephews like most teenage uncles, but they’ll also indulge them in playing “Star Wars” or hunting down bad guys, have squirt gun fights, teach them how to do cannon balls into the pool, and tolerate watching little kid shows. They also make my kids laugh like no one else. We’re so lucky to have them. This is what they looked like when I first met them 12 years ago. Their older brother was pretty cute too. And because they have a wise and wonderful mother, she lets them add their own decorative touches to the place. I love that triangle quilt! Wouldn&#39;t that be a cinch out of a couple charm pack (half square triangles) or even easier with the turnovers. CUTE! thanks for sharing! no doubt they&#39;re best the perfect uncles! Your children are lucky to have two uncles who enjoy the same activities as they do. Love the quilts too. Great quilts! Your kids are lucky to have 2 wonderful uncles! Amy….so precious! And I&#39;m with you…I see something in a magazine like that and use it for inspiration. I love those, too, the triangles are very nice! Have a great week! How funny that you would both pick the same bedspreads. And the WW pillow is the perfect added touch! I had the same thought about the triangle quilt..but I was thinking to see if I could eeck out an entire quilt top that way with what is left of my Flea Market Fancy stash! Thanks for sharing the photos of the cute guys!<br /><br />I love both of their quilts also…but if you really want to get rid of your American jane stash, you can send it to my house! Are they twins? What fabulous uncles. They won&#39;t get too old or too busy to love your kids. I have that same triangle quilt photo hanging on my wall to make for my son and dil. I am using 1930&#39;s reproduction for it. What a great post! 🙂 Love the pics of your hubby with his sweet bros as little boys. They look like a lot of fun! T and M are all grown up! I loved reading this post and looking at the pictures! You do have a wonderful mother-in-law! Hi you don&#39;t know me but my name is Cindy Nielsen and I lived in Maryland on Edgewood area of Aperdeen Proving grounds from 1993 to 1995. I believe those boys are the two youngest Smart boys. Tell me this is true. I sure loved those boys and Rosemary too. Hi Cindy! It is those same boys! What a small world. Love it. :)<br /><br />I hope you see this – not sure how to contact you. Please feel free to email me and I can put you in contact with the Smarts! <br /><br />Thanks for saying HI! Hi, me again :-)<br />My youngest brother has autism, he is 27 now and still lives at home with my mom &amp; dad… he is also the PERFECT Uncle for my son… LOVES to play Wii all day long, always up for a game, he thinks my son is the greatest thing ever…and my son thinks he is the greatest person ever too… it&#39;s pretty cool. I stumbled upon your blog a little while ago &amp; was looking around today &amp; was excited to see you were in Frederick, MD. I live about 20 minutes from Frederick. I attend church there. I was even more excited when I just discovered the &quot;brothers&quot;. My lil&#39; girl has Down Syndrome also. What a small world!